Demand for learning new technologies keeps rising and the faster technology moves, the more (and faster) people have to learn. The speed at which software is moving is exemplified at Dreamforce 2015. Salesforce announced a dizzying array of new products and feature enhancements including the App Cloud, Analytics Cloud, IoT Cloud, Thunder, Lightening, tighter integration with Microsoft, to mention only the big ones. As a professional trainer, my mind spins thinking about all the new things people need to learn just to keep up. Salesforce takes learning seriously. For good reason. They have data that suggests people who attend Salesforce University classes have higher adoption rates, are more productive, and renew at higher rates. If you had this data, you’d take learning seriously, too. Do you have that data on your product? To demonstration how demand for learning is increasing, let’s take a look at Dreamforce 2014. Last year, Salesforce trained over 10,000 people in live training sessions and proctors certification exams at the conference. These are staggering numbers. And considering all of the new announcements at Dreamforce in 2015, it is not nearly enough to just offer live training to 10,000 people. To address the demand, Salesforce University created an innovative, self-directed way for Dreamforce participants to learn new skills and win fun prizes along the way. It’s called the DevZone Quests and Mini Hacks. Here is how it works. The DevZone Quest has three phases of tasks that people need to complete. The DevZone Quest has four demos covering the following topics: App Cloud, Design HQ, IoT Cabin, Partners. These demos help participants get started learning what can be done in Salesforce. For example, developers can see the App Cloud features and how it works, to set the context for how Apps could be developed. In the Design HQ, people learn about the new Salesforce UI, Lightening (This is big news all by itself. The first major UI update in 16 years). The Internet of Things (IoT) Cabin shows off use cases. IoT is so new, people need to know what is possible and what people are doing? “Why would I connect a motorcycle to the Internet?" In Step 2 of the journey, participants pick up a starter kit that covers all the resources needed to get started in learning Salesforce for any role. And there are a lot of roles that use Salesforce: developers, administrators, and end users in sales, service, marketing, community, and analytics. The final part of the DevZone Quest is performing specific actions (Mini Hacks) to get hands-on experience in some the new tools. These hands-ons experiences with core App Cloud features, guided tutorials with expert facilitators leading the way, and mini challenges that when completed, earn participants prizes. Combine all of this with earning achievement along to way, and you have a fun way to experience some of the new things in Salesforce and explore possibilities you had not yet thought about it or even knew were possible. As steps are completed, participants earns stamps that unlock prizes, from t-shirts to hoodies. 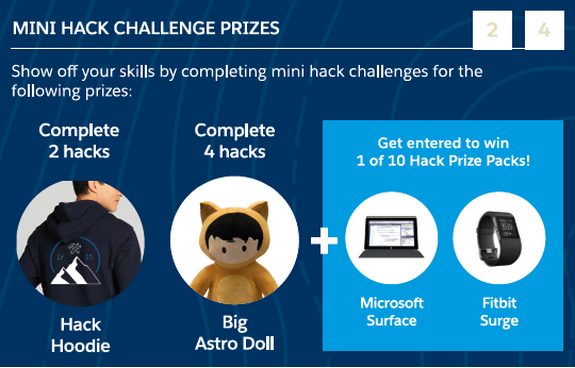 As participants completed more advanced tasks like hacks, they are entered into giveaways to win higher value goodies like computers, kayaks, and mountain bikes. DevZone Quest is great because it taps into both intrinsic and extrinsic motivations.